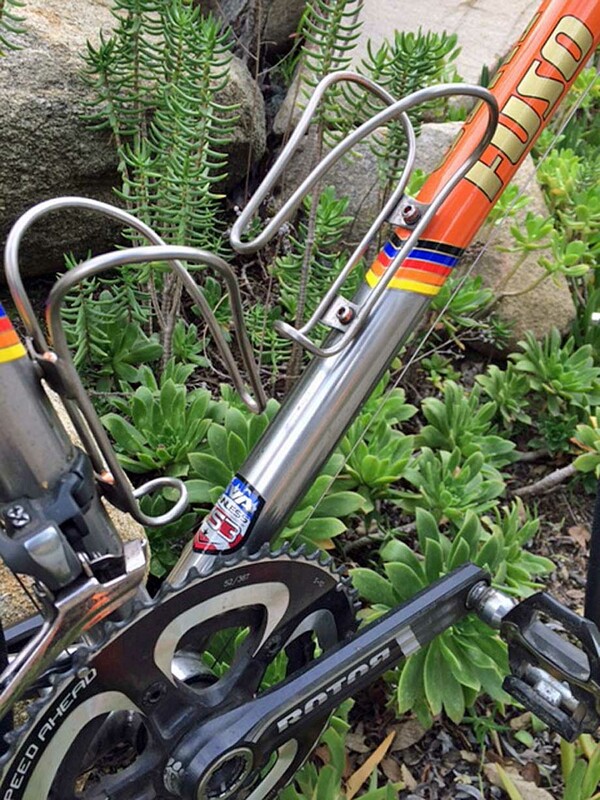 It's time for another Retro Readers' Rigs, the column where PEZ-Fans send in photos and a story about their bikes. 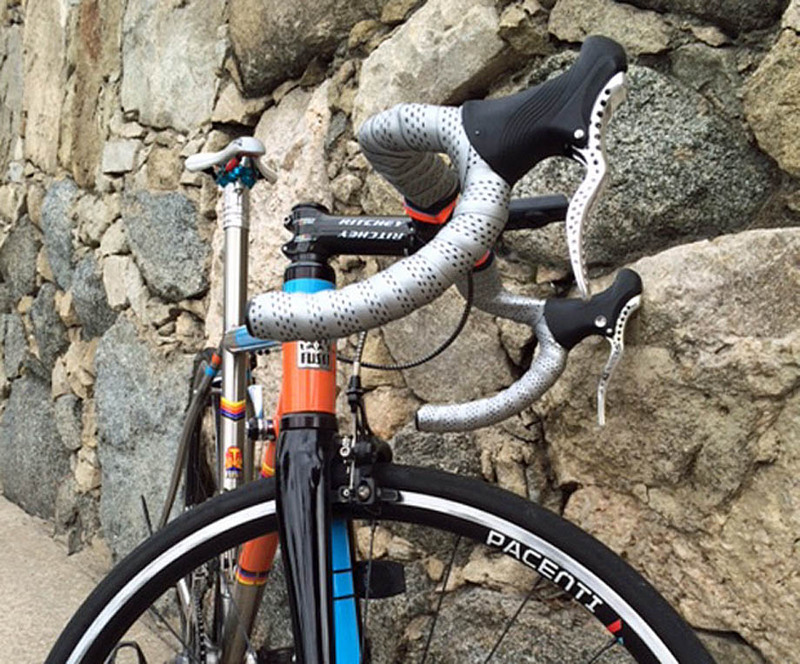 A Readers' Rig could be anything from a $15,000 carbon fibre super machine to a vintage racer or something that's completely out of the ordinary like this custom painted stainless steel bike with retro style downtube shifters and drilled out brake levers. When did you buy it? What made you choose this bike? I bought it in April 2014. 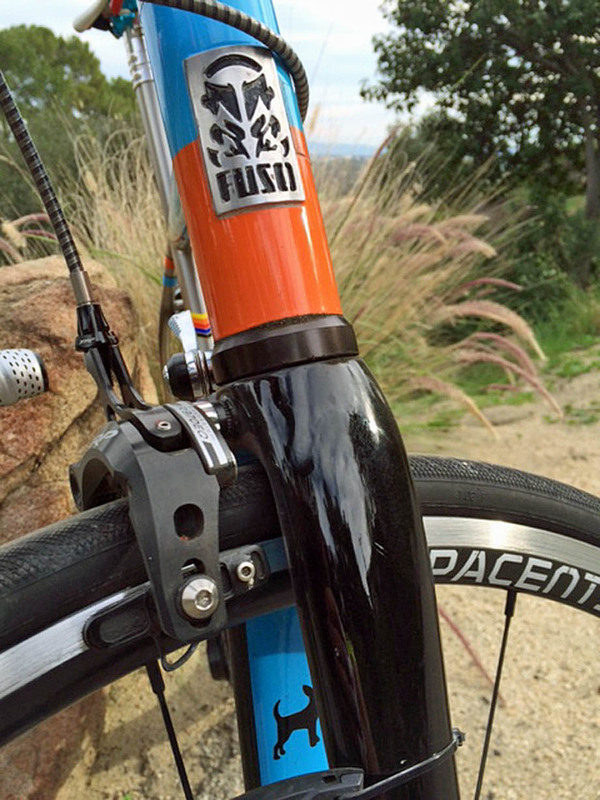 It's made by RE Bikes in Seattle of KVA stainless with design by Dave Lieberman of FUSO. 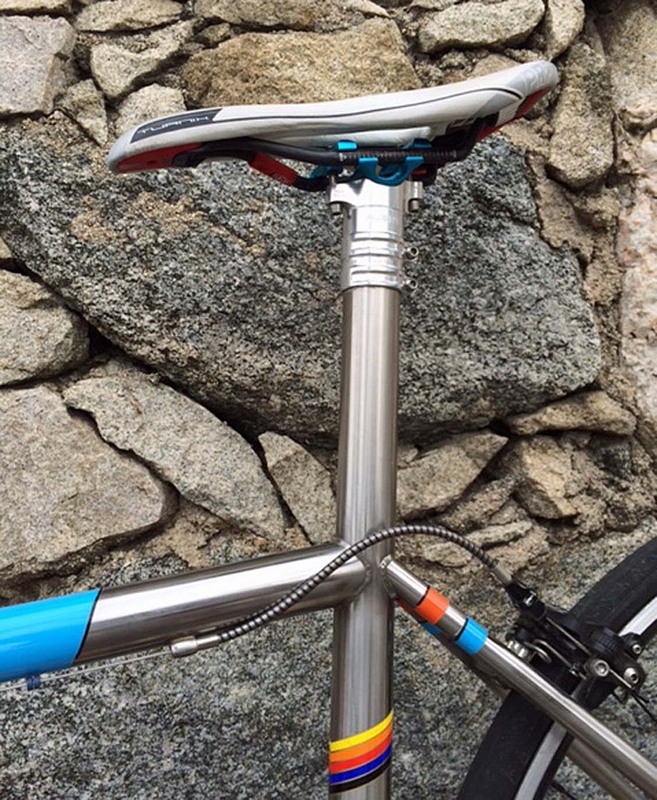 It's a painted Stainless Steel bike that features hourglass stays, BB30 for the Rotor cranks, tapered headtube with Liebo cups and ENVE fork. Legendary builder Dave Moulton's company carried on by Russ Denny. 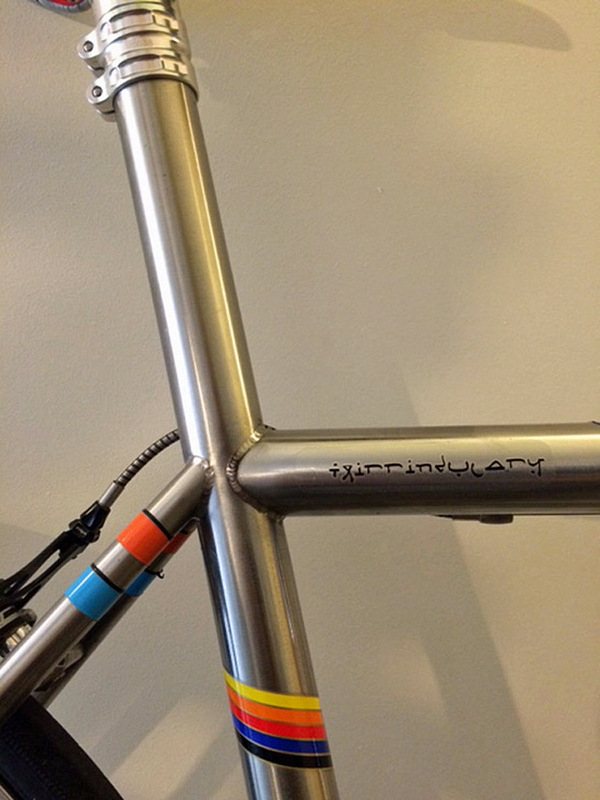 Builders who designed the Ritte Snob and agreed to build stainless steel with ISP, BB30 and tapered headtube. The bike is running 'old school' Dura ace 9000 derailleurs with downtube shifters, TPR mag brakes and drilled out brake levers. 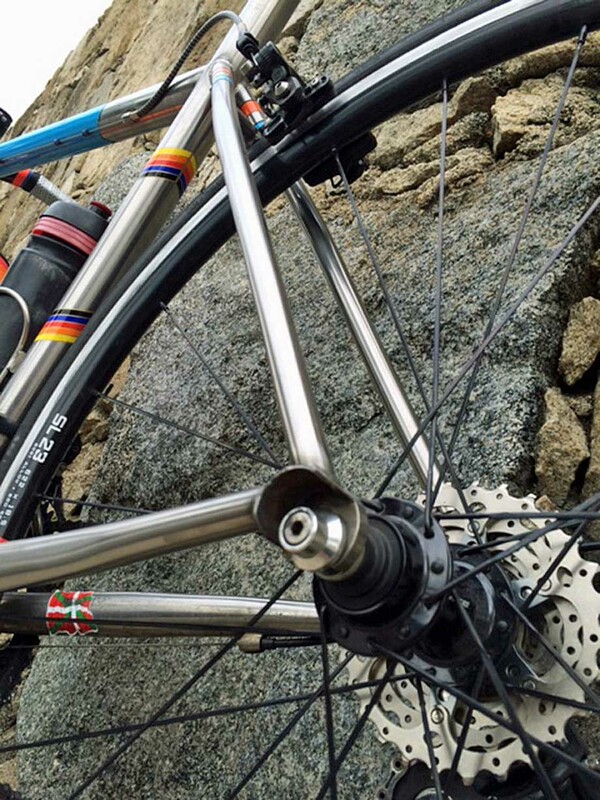 I also have Pacenti rims laced to DA 9000 hubs by Pro Wheel Builder. 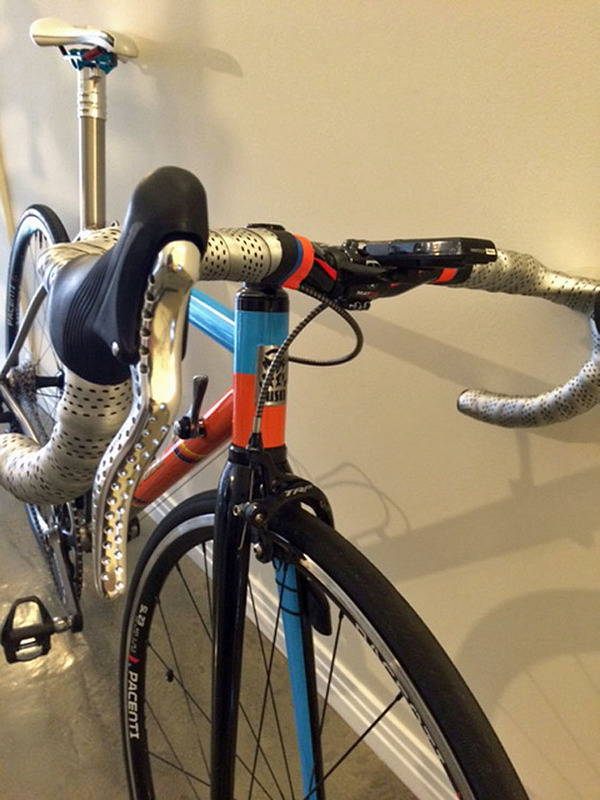 FSA compact wing bars, PRO Turnik saddle & King stainless cages. In 2014 I rode 9700 miles on my Fuso - around 15,600 kilometers. Pasadena, Angeles National Forest, Muholland Highway. Any ride. Yesterday I threw the bike over a road block and headed up a path above Dodger Stadium in Los Angeles' Elysian Park. Three quarters of a mile up there was a fork and a homeless woman. I asked her which route would take me down, she ranted for 10 minutes in detail about the hole in the fence, the steps, bushes and her needing some orange hiking boots to get to the freeway and a path that ran along it. I decided to go in the other direction that would take me to the area where the Low Rider car clubs convene on Sundays and there I could compare my custom rig with theirs. Last words? 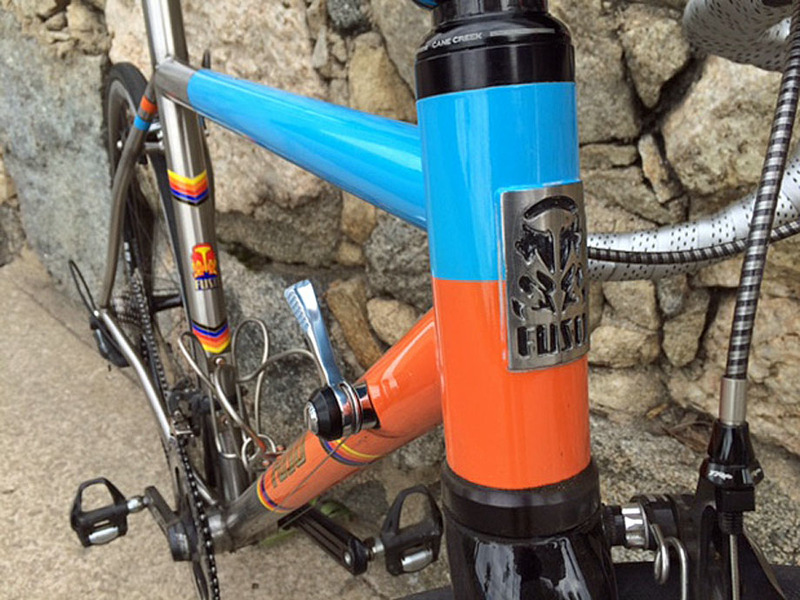 The headset cups were design by Dave Lieberman of LIEBZO Bikes with the custom paint by RODRIQUEZ-ERIKSON of Seattle, Washington. I have owned more then 30 bikes in my life. 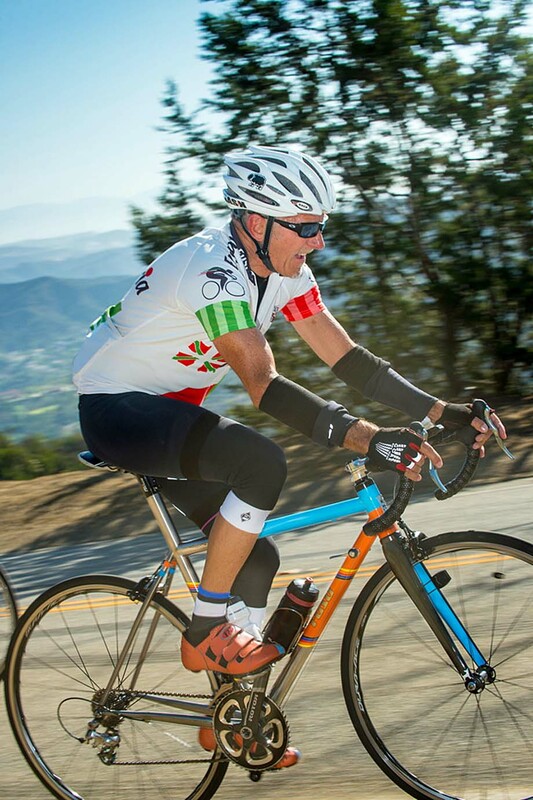 After riding the route that Pais Vasco takes near Bilbao, Spain I came home to California wanting something that was more comfortable, yet light enough to take on hills. 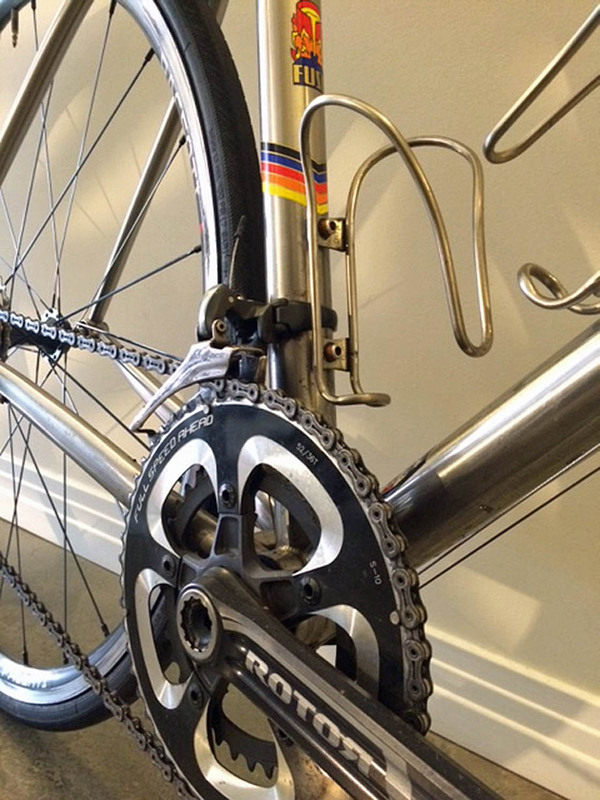 I built up a Moser Leader AX frame set with one ring and a ten speed cassette and discovered how much I enjoyed steel. But this bike was so heavy with it's compression plug seat post, quill stem, standard square bottom bracket and steel fork. I saw a RITTE Snob on the road and talked with a musician who had just purchased a stainless BAUM. I called Dave Lieberman at FUSO and began the process. 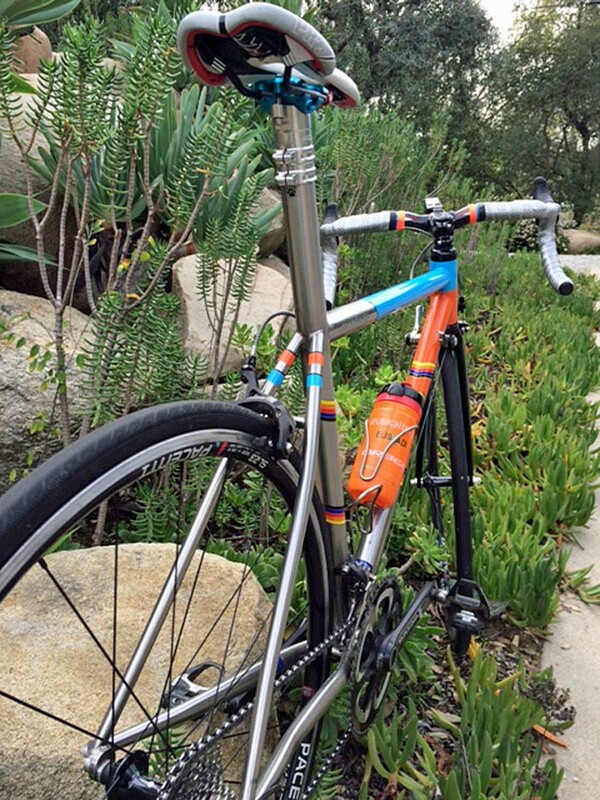 The frame would have a geometry similar to my Wilier Cento Uno with an integrated seat post. I wanted to add some color and discovered this would take a special painter because sticking paint on stainless steel is no small order. The wheels are a bit wider then the HED C2s I have used in the past, with 25mm tires I can handle gravel roads. 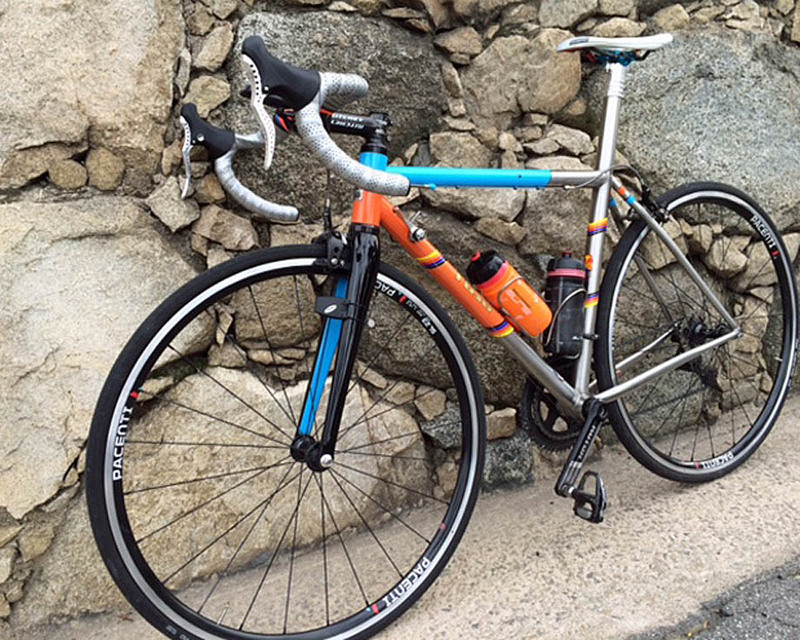 Thanks to Chris for sharing his unique ride with us. 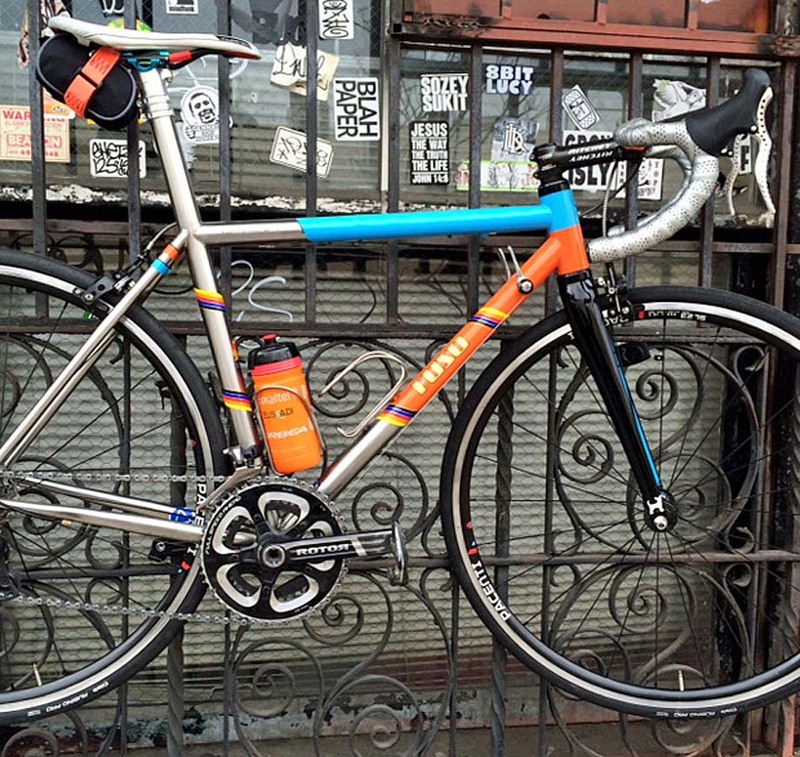 Got a bike that deserves some glory? 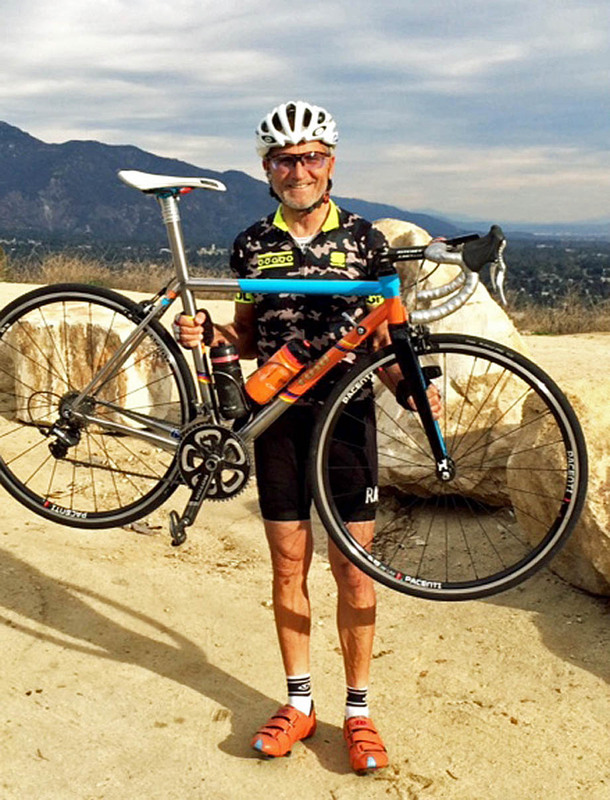 Send us a Readers' Rigs submission to [email protected] and your bike could be featured in all its glory here on the pages of PEZ.